Following the 'appetiser' to promote the dietary aspect of the game, here's 12 all-new screenshots along with details about police chases, carjacking, bike tricks and more! Ready for a Workout? Something our editorial director should take note of - avoiding fat isn't just about eating properly - it's also about - gah - exercise! In order to stay in peak physical shape, like the rest of us, CJ could benefit from a little time at the gym. 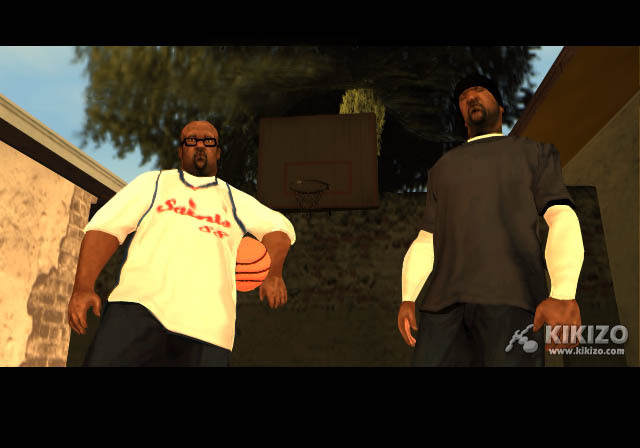 There are several gyms in San Andreas where CJ can workout. The gym in Los Santos is a tough place - just like those using it. 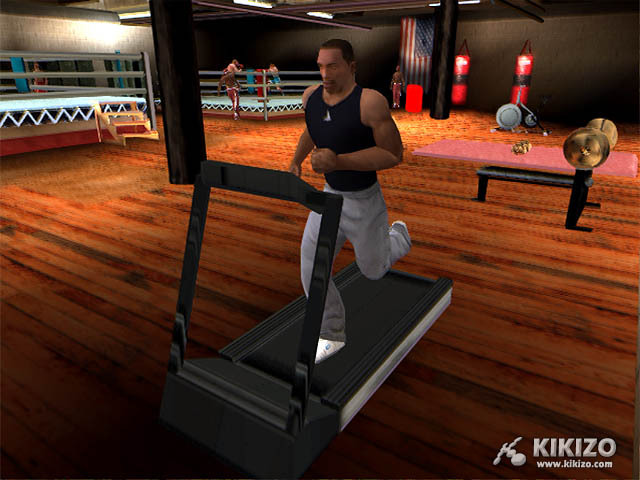 Gyms vary from one to another in terms of equipment and so on, but the one shown further down the page has a variety of workout options to burn off unwanted calories and build stamina and muscle, including the treadmill, while the option for CJ to develop his strength by doing barbell curls and bench presses is also available, as shown in these screens. 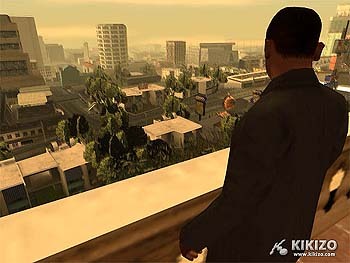 Working out will give you the strength and stamina necessary to have any chance of surviving the streets of Los Santos. A healthy CJ will run faster, cycle faster and swim faster. As CJ becomes healthier his stamina will also increase and he will be able to keep up the pace for longer. His recovery time will also be faster. Outside of the gym also, the more CJ runs, the more his stamina will increase. A chubby CJ will pant and struggle to regain his breath. As in previous Grand Theft Autos, the more frequently he runs and sprints, the more stamina he builds. But now, as CJ's stamina increases, the player's ability to complete missions and tasks will improve dramatically. As CJ works out he will also gain muscle and strength. As he gets stronger he is better placed to win a fight as his punches and kicks will increase in force. The relationship between body fat and muscle is not automatically the inverse of one another; these are 2 separate statistics, which result in a lot of different combinations depending on how you want CJ to be. 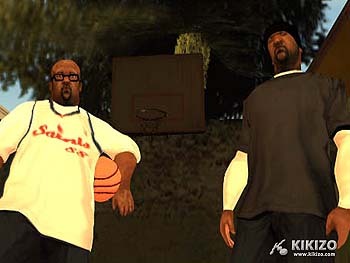 So, for example, CJ can build strength and be fat. When overweight or until his stamina has been built up CJ will grow tired very quickly. Each city has a distinct style of gym, each with its own look, feel and type of characters who visit as well as its own type of equipment, workout and instruction available. The gym in Los Santos is a typical, grungy gym, the sort of first-floor joint where you can imagine gang members hanging around and sparring. Not only can CJ work out here but this is also a good place practice your fighting skills and to learn new fighting moves to complement the moves you started the game with. Get fit from the comfort of your armchair! 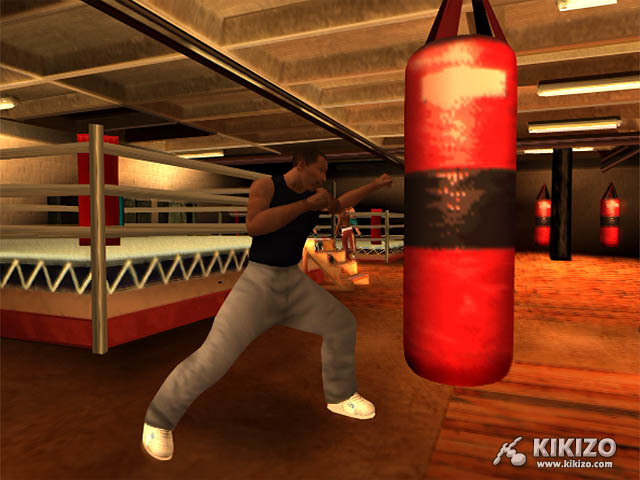 By taking on an opponent in the ring CJ can learn a variety of fighting moves to put his new found strength and stamina to the test-punch combos, punching on the ground, and punching while running are all new skills that will come in very handy in Los Santos. The gym in San Fierro, in contrast, is a serene dojo. Here you can learn and practice an entirely new set of fighting techniques that we will be releasing details on later. The gym in Las Venturas is a seedy, down-on-its-luck boxing facility with a ratty ring in the middle and numerous holes in the concrete floor. Here CJ can learn street fighting and some pretty aggressive and below the belt moves! While fighting the player can now lock-on to opponents during melee combat and the use of a second button has now been incorporated allowing for more advanced moves and combos, enabling CJ to pull off some crazy combination moves! Plus self-defense has been incorporated - CJ can now block incoming blows from attackers. Bike Tricks: As you can imagine the BMX bike is particularly fitting for getting around the Los Santos neighborhoods. 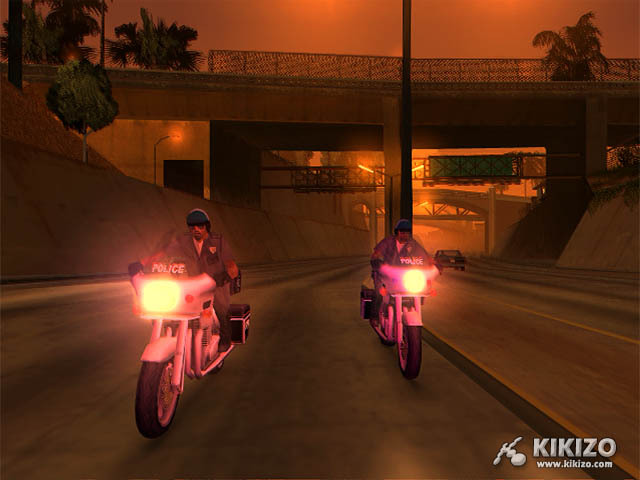 It's great for going short distances especially as it's inconspicuous and convenient - it allows CJ to weave through traffic-clogged areas of Los Santos, get down narrow alleyways that larger vehicles cant follow you down, and it's also a lot of fun to ride. But riding a bike is work, you can't just hold down a button and expect to tear off at great speed, you have to tap the button to build up your pace. 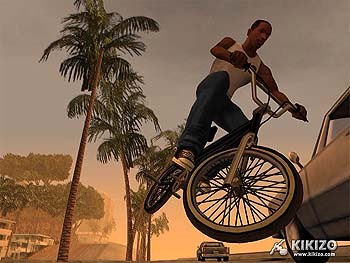 The more CJ rides the BMX, the better he gets at it. He will build up stamina and be able to keep riding longer, but his skill will also increase, he will fall off of the bike less, and the bike will handle better and be more responsive. It wouldn't be a BMX if you couldn't do tricks on it, including bunnyhop, wheelies and endos, and CJ can also perform a variety of combinations, including 360s and 180s on the BMX. 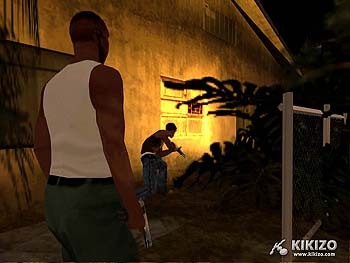 Police AI: The police in San Andreas are pretty smart and responsive. They will try a variety of tactics to take down anyone they've got it in for. During high-speed pursuits, police will open fire with their weapons and will follow, not only from behind but also from all possible angles-coming at CJ head-on, down side streets, cutting him off or ramming his car in order to end the pursuit. They are also very skilled at following a suspect with the spotlights on their helicopters. When they point one of these lights at you, the light is too bright to see anything, making it much harder to take out the helicopter or aim at the cops on the ground in the direction the light is shining from. Shining bright lights in the eyes of the criminal to paralyze him is a well-known tactic that is frequently used by LSPD. They also will look out for their own safety and will seek out and use cover during gunfights. You may have noticed the motorcycle cops, watch out for them, they also have the ability to fire their guns while in pursuit. The San Andreas police force has quite a challenge keeping the peace and patrolling the streets of San Andreas. Be careful, they are up for the challenge! 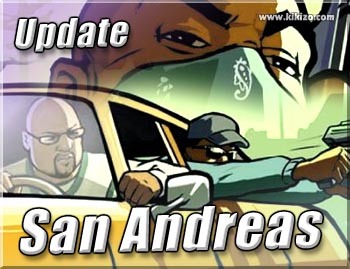 Carjacking: The population of San Andreas it seems are fairly street smart and not unused to dealing with car thieves. Many of them will put up a fight and instead of merely pulling a driver out from behind the wheel, CJ may often need to resort to a stronger method of persuasion when jacking his vehicle of choice...! 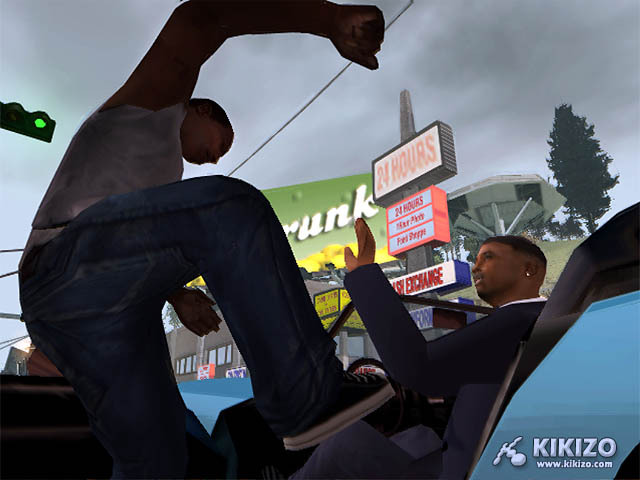 For example CJ may have to kick, punch, pistol-whip, or bash the head of the driver into the dashboard of their car to jack a vehicle. Nice! Lighting Models: Meanwhile, more details about the game's visual engine have emerged. 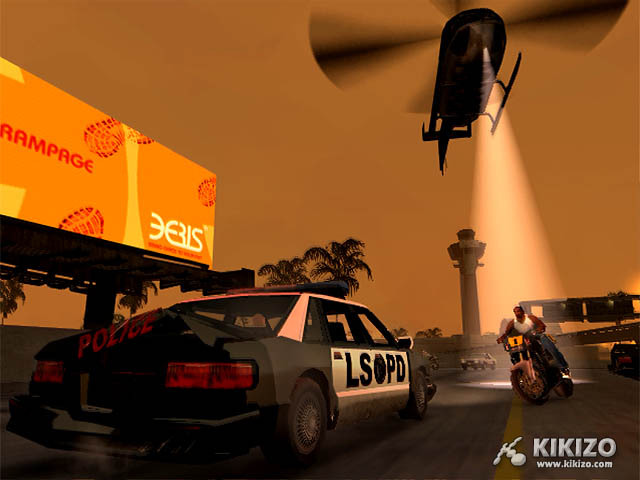 The lighting in Liberty City was designed to be grim, distinctly urban, and rather depressing even with sunlight. Vice City was the total opposite--bright and sunny, giving the city a warm, friendly and optimistic glow - however superficial. San Andreas is such a huge place with so many different atmospheres, lighting is such an important part of setting the mood. The lighting in downtown Los Santos feels very different to the light in the open countryside and again very different to the artificial glare of Las Venturas. Every item in the game has been modeled for both day and night. Shadows and textures are unique not only to each individual item, but specific times of day. Cars will look different from day to night. Shadows will change with the time of day. Also, very specific lighting schemes were assigned to the cities in San Andreas. 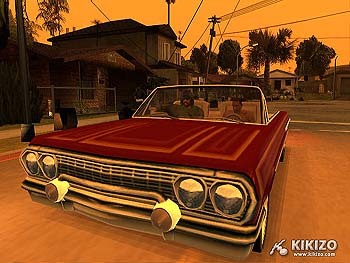 Los Santos was designed to reflect the lighting environment of Los Angeles. Smog is an element in the atmosphere, at times a physical presence, leading to dramatic sunsets. Lighting was used to give each city a distinct physical presence. San Fierro and Las Venturas have very different lighting effects - as you can imagine based on the cities that they are inspired by. In San Fierro for example the changeable weather with crisp blue skies and fog and rain call for very different lighting from the oppressive, dirty heat of Los Santos. The glitz and neon of the Las Venturas strip contrasts with the blistering heat of the desert where you can literally see the shimmering heatwaves coming off the ground. 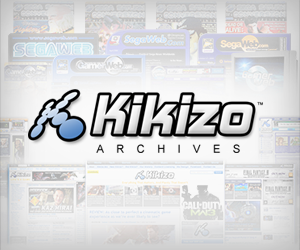 Update: even more information and new screens added here!